In the Washington Post two years ago, a Washington, D.C.-based scholar argued in favor of a solution to the vexing issue of modern-day piracy that was decidedly at odds with the long-standing international practice of capturing and prosecuting pirates: Just kill them. On Tuesday, the ruling party in Denmark essentially agreed with Ikle, arguing that the Danish navy should be allowed to sink the “mother ships” often employed as at-sea bases for modern-day pirates. The Liberal Party also proposed that Danish naval mandate should allow the boarding and confiscation of pirates’ mother ships, according to the Politiken newspaper, courtesy of BNO News. Both proposals are being considered by Danish government ministers. It’s a particularly touchy subject in Denmark, still reeling from the hijacking of seven Danish citizens on February 24. 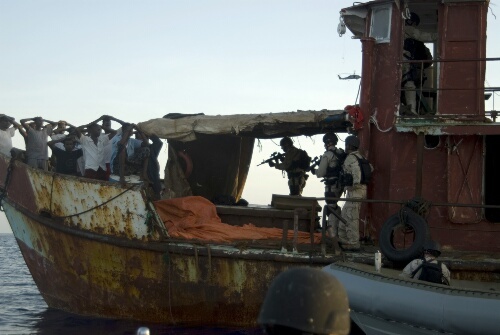 Two other Danish hostages have also been held by pirates since mid-January, BNO News reported. According to the report, Nils Wang, commanding officer of the Danish Defense Academy, said that a wider strategy is needed for anti-piracy operations in the Indian Ocean than simply chasing pirates. Wang proposed that the United Nations sets up a new and efficient coastguard, in which Denmark could contribute. Wang’s proposal calls for foreign ships to pay fishing licenses so that Somali pirates can once again work as fishermen. The U.S. Navy adheres to the 1982 Law of the Sea Convention and customary international law while contributing forces to Combined Task Force 151, a counter-piracy task force that operates in the Gulf of Aden and the Indian Ocean off the Somali coast. Member navies can intervene during pirate attacks in progress, can retake ships with special forces troops after a pirate seizure and can strike pirate bases ashore. But they can’t just blast suspected pirates out of the water. Ikle, writing just after American mariner Richard Phillips was dramatically rescued in 2009 when Navy snipers on the destroyer Bainbridge shot and killed three pirates in an enclosed lifeboat who were holding him hostage, argued that if pirates show aggression, navies should be free to open fire. My solution to this is the same as I proposed for Libya (though I think it’s too late on Libya). Why make it a formal policy to sink the mother ships? Just do it and claim ignorance. Is anyone going to be making a big fuss about a Somali ship that suffered an unexplained internal explosion and sank? but killing some does not in the least dissuade others, as Ilke fails to comprehend. Picture this: your Momma loved you dearly, but kicked you out of the house at age 10 because she could no longer afford to feed you AND your numerous siblings. At 16, you have been scrounging and barely fending off starvation. You have endured every imaginable and unimaginable indignity to survive. Now this nice man, a Pirate Captain, offers you all the Qhat you can chew, plus the lottery chance of scoring big, if all you do is hijack a ship that is practically inviting you aboard. If you are killed, you aren’t much worse off than if you keep living. But if you score a ship, man, you are set. Brian, I fail to see why I should feel angst about pirates. They have murdered four American citizens and we have done exactly zero to insure the safety of American citizens. Did you know the first six frigates in the United States Navy were financed, built and manned in response to….piracy? It’s not like we don’t know what to do..it’s a matter of national will at the executive level. I personaly don’t give a damn about the average Somali; in case you forgot, we’ve tried to help that nation once before. They didn’t seem to be all that happy to get the help. Even if killing them doesn’t dissuade others, it sure as heck dissuades the ones that were killed from doing it again. Seriously…..all we need is some yardarms, and a rope. This has been something that pirates all over the globe have understood for centuries now. I think the website “somalicruises.com” offers a reasonable but sadly only tongue-in-cheek approach.